As a mom of three, I couldn't stress how important personal hygiene is for me and the family. It's one way to prevent and protect ourselves from sickness, di’ba? I teach my kids the importance of bathing, brushing teeth and washing hands, to name a few. And for any homemaker, having a clean house (take note, I didn't say organized) is also important in keeping the family safe and healthy. Cleanliness is one of the top priorities of a mom, like you and me. Whether it's for ourselves or the house (actually everywhere! ), we use WATER (we cannot live without it!!!!) for cleaning. But have you ever wondered where the used water goes and its journey in our eco-system? What we know is after using them in the sink in the bathroom or in the toilet, they go down the drain. And we stop there. We don't really care or pay much attention to it, kasi after all, it's already waste. I realized, we actually should CARE about wastewater management! We really should! Why? You know the saying "Ang basurang tinapon mo, babalik din sa’yo."? It's the same principle pala with our water use. I learned all about this from Maynilad. We all need and want CLEAN water to siyempre help us clean ourselves and our surroundings, right? But if we don't have reliable and efficient wastewater management services and facilities, this won't be achieved. I'm so relieved to know that our area (they call it the West Zone covering the Greater Manila Area - Tondo, Sampaloc, South Manila, Malabon, Navotas, Caloocan, portions of Quezon City, Magallanes Village in Makati City, and Ayala Alabang Village and surrounding areas in Muntinlupa City) is already covered by Maynilad's sewerage services. Maynilad collects, transports, cleans and disposes used water so that it can be cleaned and safely discharged to receiving bodies of water. 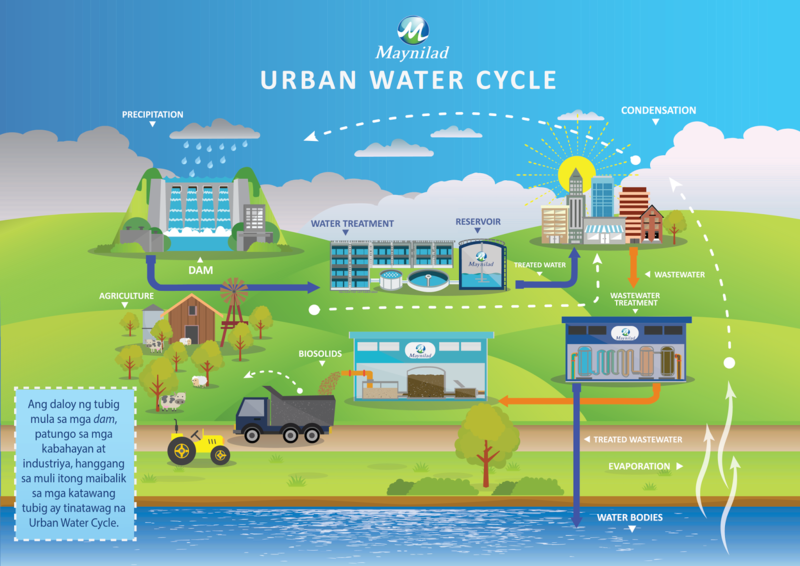 Households and business establishments in the covered areas are connected to a sewerage system, which conveys wastewater from households to facilities where it is processed before it is discharged to a receiving body of water. Do you know what could happen if we just discharge wastewater without proper treatment back to the oceans? We'll all get sick one way or another. If wastewater is untreated through treatment plants like Maynilad's, we get back not so clean water. For the sake na lang of our children and the environment, we should really pay attention to wastewater management so that we can avoid diseases, maintain a clean environment, and protect our ecosystem. Maliit na bagay but malaki ang magagawa in helping Maynilad protect the environment and the health of communities it serves through wastewater management. So if you're in Maynilad's sewered areas, you may avail of the services through an application form available at the Maynilad Business Area Offices. Those who are in areas not yet covered by Maynilad, may avail of the septic tank cleaning services. With Maynilad's septic tank cleaning services, customers are assured that their wastes are properly collected, treated and disposed because Maynilad abides by all necessary government regulations and operates world-class wastewater treatment plants (ISO-certified).